On Santo Tomas Beach, these apartments are spacious and well-equipped. 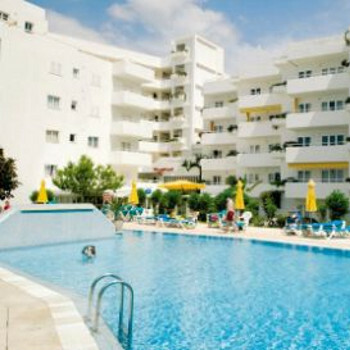 Suits families with younger children and those looking for a relaxing holiday close to the beach. The apartments are all privately owned and it is the luck of the draw what you get, I paid extra for internet in the apartment it did not work and could not get a refund. The time of year we went October it was quite but the weather was very good, the in-house restaurant was good but basic, the local restaurant was rather hit or miss, and most were getting ready to close for winter. I would not go back but we would return to Santa Tomas. Hotel tip: Try to get a third floor room or above with sea view. well, what can we say this is now our 7th year back to hamilton court it is superb great for young famlies or couples, great staff polite and helpful and always a better class of holiday maker here. if you like noise pubs fish n chips its not for you! but if you like quality and a great location look no further we are going again this year in july for 2 weeks. Thank you to Jesus and his great team. We booked in to the Hamilton court appartments on a self catering basis. We had a two bedroom appartment on the first floor. The quality of service and cleaning were the best wehave experienced in a long time. When we ate in the restaurant the food was excellent with friendly staff. We have just returned from a 2 week holiday in hamilton court and we are so pleased we have. If you are looking for a quiet holiday then this is the place for you but with 3 children who easily get bored its not the place to be. Santo thomas consists of one long street with 2 mini supermarkets which are the same and about 4 gift shops. There is one road in and out and no coastal road at all. You can walk into son bou which we did but regretted. It took us about 1 1/2 hours and was like walking in a desert. The walk was mostly on a sand path and it was so tiring to do. Then we had it to do on the way back home too, buses dont run from santo thonmas to son bou. BIG tip if you have children, stay on the beach by the hotel, if you walk to the left to son bou beach its full of nudists, if you walk right to the little baech past the cafe on the rocks its a propper nudist beach, no warnings at all. WOW was that embarasing, we made a quick exit and told the kids to look at the planes in the sky LMAO. The hotel restaurant's in santo thomas all seem to have the same menu so not much variety in food. The hotel and staff were great, 1 min walk out the back gate to the beach which is great when you have lilo's buckets, towels etc to carry. Our worst complaint was the room we had, it was room 4 on the ground floor right next door to the bar/restaurant and boy is it noisy. It closes at about 11.30-12.00 but about 7 am the maintainance guy is making noise outside cleaning up and its also right next door to the kid zone room too. To make matters even worse for 1 week of our stay we had a group of single teenagers in the room above us playing load music and banging about till all hours. They took over the pool and made it so the children didnt feel safe in there with the lads dive bombing into the pool all day. As always you have to go out at 7.30 am to reserve a sun lounger or you wont get round the pool at all till about 6pm when they all go for supper. We also noticed a few spanish people just walking in off the beach and using the pool for a while then going again, there is no pool attendant/lifeguard to stop this either. None of them pay attention to the sign that says pool is for residents of hamilton vourt only. One of them even kicked my daughter in the face in the pool and didnt seem to care. This is the first time that we have stayed in Hamilton court apartments. Now I am a fussy wotsit (ask my wife) but this place was fantastic. Clean, great location, good pool and a two minute walk from a lovely beach. Staff are very friendly, and the Kidzone is smashing. Entertainment was low key, but there is enough to do in the resort, and Las Dunas is a good laugh. Came here for a family holiday,my husband and I,my Mum,our 2 teenagers aged 13 and 15 and our son's friend aged 14.Hamilton Court is a lovely apartment complex.We stayed in a 2 bedroom apartment for up to 6. Very spacious,clean and well equipped. Here's my detailed description of the apartment.Not air conditioned but ceiling fans in bedrooms and lounge,further fans can be hired.If you can't cope without a television they are available for hire,we didn't enquire about the fans or television so I'm unsure of the cost. Front door leading to spacious entrance hall. hatch to dining area of lounge. gas cooker with 4 burners,full oven and grill. full size fridge with freezer (not tiny icebox) above. sink with draining board and draining rack. plates,side plates,cups and saucers,cereal bowls,soup bowls,glasses,saucepans,cooking utensils and cutlery (including sharp preparation knives,tin opener,bottle opener),chopping boards. I would suggest you bring large plastic plates if you eat a normal size meal as the dinner plates are very small,also an electronic igniter for gas rings and oven. Microwave can be hired (sorry,didn't enquire so don't know how much). Full size bath,overhead shower(powerful),shower curtain,basin with good sized surround,bidet,toilet. Hot water only ran out after 4 showers and didn't take too long to heat up again. 2 full size single beds. plenty of extra pillows and blankets (was very hot so we only needed sheets). large dressing table with mirror and drawers. double wardrobe with further drawers. Stayed at Hamilton Court Summer 2004 with my wife and 2 children. The complex was superb and we had a brilliant family holiday will be returning in 2005!!! We have been to Hamilton Court many times now and it has been a most enjoyable hotel. The staff are friendly and the facilties great. There was not much entertainment but there is plenty near by! A fantastic stay for the whole family.